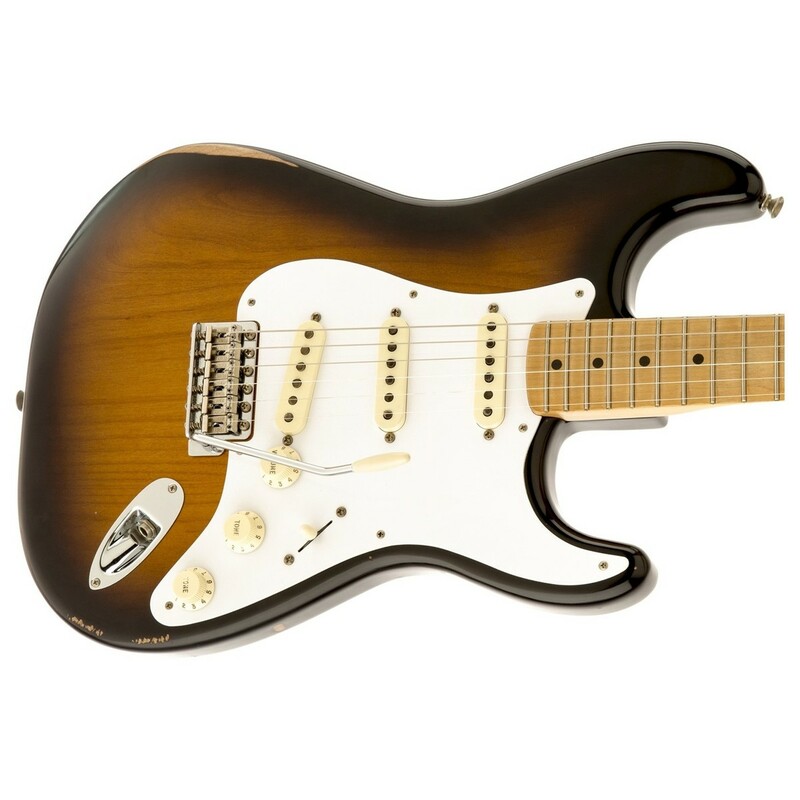 The Fender Road Worn 50s Stratocaster, 2-Tone Sunburst is perfect for vintage rock enthusiasts, offering the stunning aged look, feel and sound of a well-used 50's guitar but with all the reliability and quality of a brand-new instrument. The lightweight alder body delivers a beautifully balanced tone, and its distressed 2-tone sunburst creates a visually stunning aesthetic. The soft ''V'' maple neck and fingerboard is ideal for players with large hands, providing an incredibly comfortable performance and bright tonal characteristics. A set of Tex-Mex single-coil pickups provides the Strat with a modern tone, while retaining the characteristics of the vintage guitar for a sparking high end and increased output. The Fender is finished off with a vintage-style tremolo, adding to its look and offering stunning pitch shifting effects. 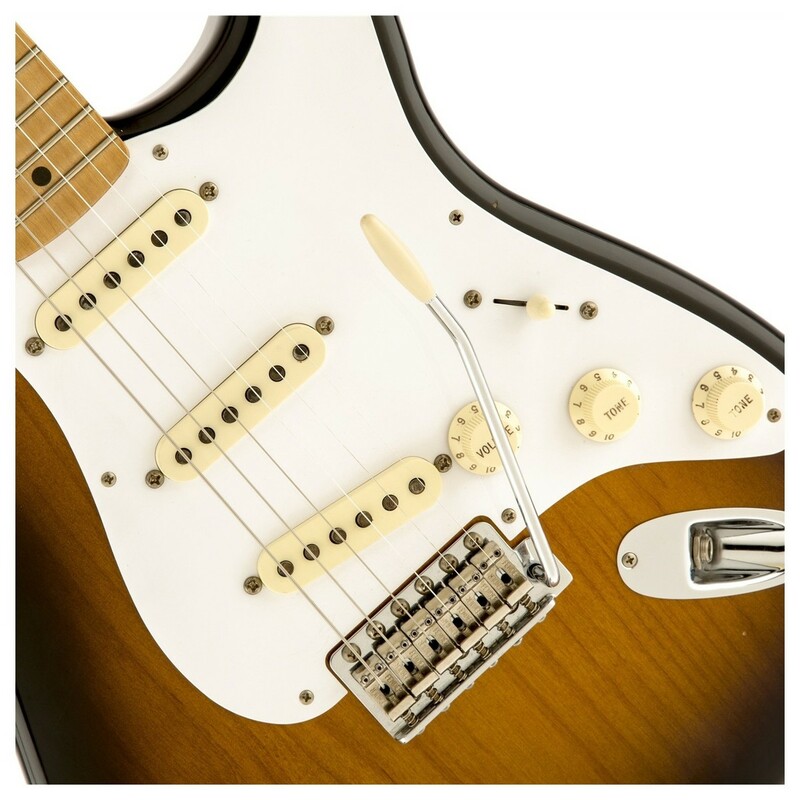 Built to look, sound, and perform like it's seen many miles of road and been played on countless stages, the Road Worn 50s Stratocaster is the ideal choice for players who appreciate the broken-in look and vibe. 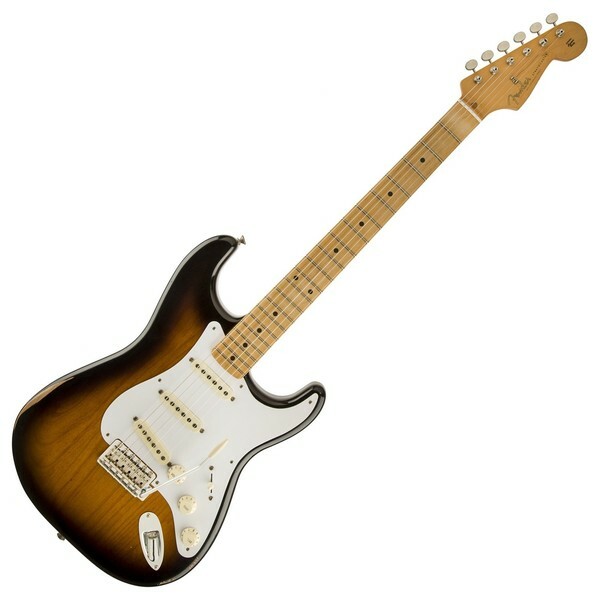 The 50s Stratocaster features an alder body in a beautifully road worn finish, mimicking the wear and tear of a guitar that’s been on the road for many years and seen of stage time. Alder is an excellent tonewood, producing balanced, resonant tones with plenty of clarity and midrange bite ideal for the versatile musician. The body delivers a decent amount of sustain, creating bright, sizzling highs, beautifully rounded lows, and a beefy midrange. 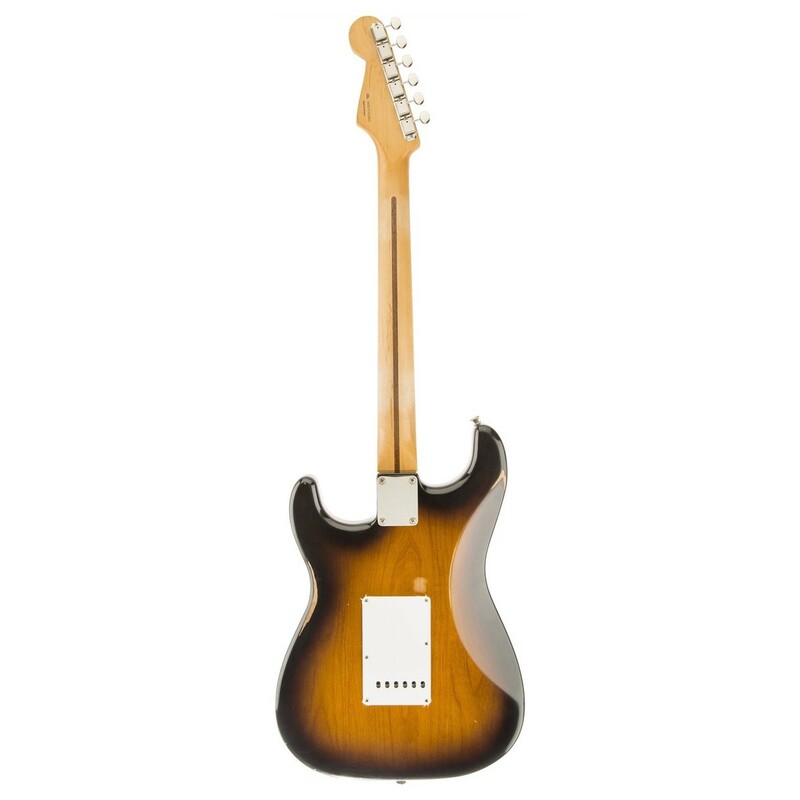 Fender have used alder as their tonewood of choice since the 1950s, as the balanced response and slight upper middle definition makes it perfect for rock and blues playing. 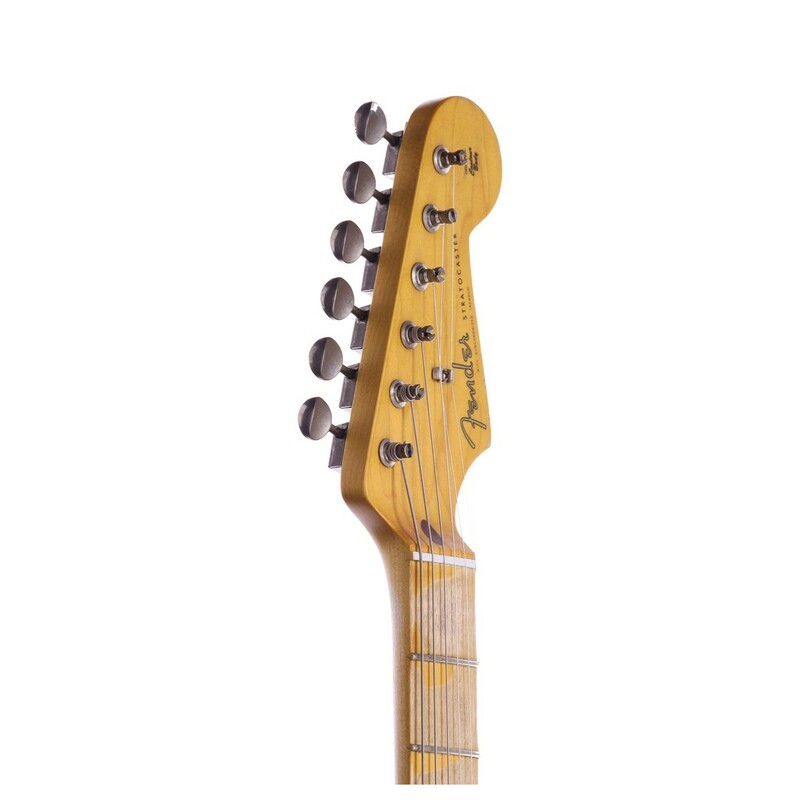 The Road Worn Strat features a soft ‘’V’’ neck profile, taking the pronounced sharpness of the classic ‘’V’’ profile found on models from the 50s and softening it up to create a more rounded shape. 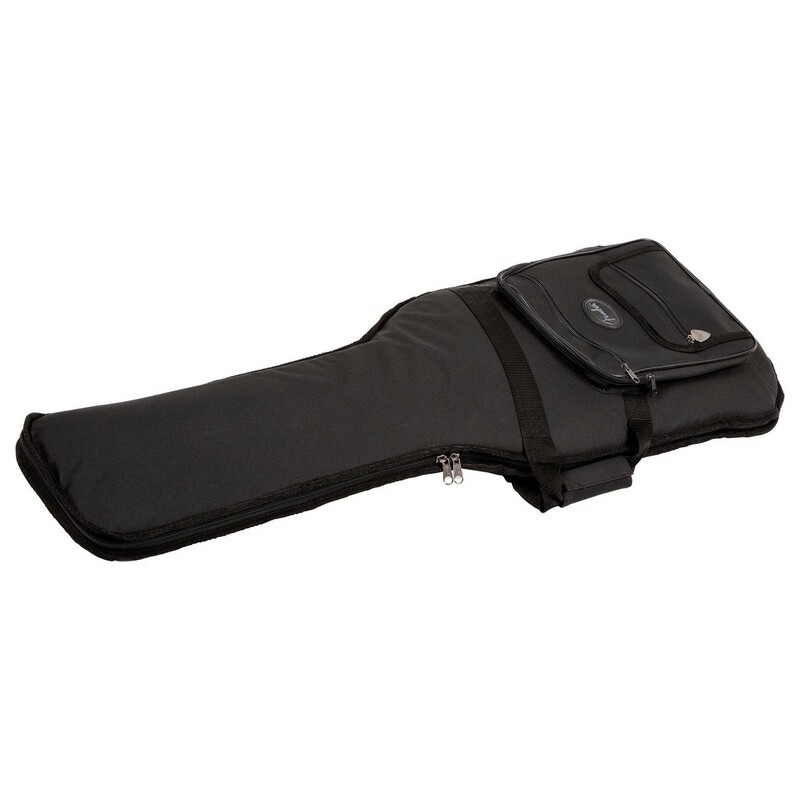 This profile delivers a distinct comfort for the fretting-hand and is ideal for players with large hands whose thumb extends over the fingerboard’s edge. The maple tonewood provides the Fender with a beautifully bright characteristic, tightening up the overall tones and delivering plenty of cut and bite. Using maple for both the neck and fingerboard provides players with a sharp, clear punch when the strings are hit hard, while light to medium picking brings out the subtler tones of the maple. A set of Tex-Mex single-coil pickups infuse the Road Worn 60s Stratocaster with a beautifully modern tone, whilst still retaining the characteristics of the vintage-style guitar. Designed with alnico V magnets to deliver extra focus and dynamics, the Tex-Mex pickups are over-wound to provide the guitar with a tight, clear bass response, sparkling highs, and an increased output. The middle pickup is designed with a reverse-wound reverse-polarity setup, eliminating any hum when used with the bridge or neck pickups. Also featuring staggered pole pieces for a balanced output, the Tex-Mex pickups are ideal for blues, rock, country, pop, and jazz. Another addition to this model are the 21 narrow tall frets, which are mounted on the pau ferro fingerboard and provide incredible comfort when performing slides. Being slightly narrower than standard medium jumbo frets, the narrow tall frets are incredible effective for bending notes and playing chords with superb intonation. 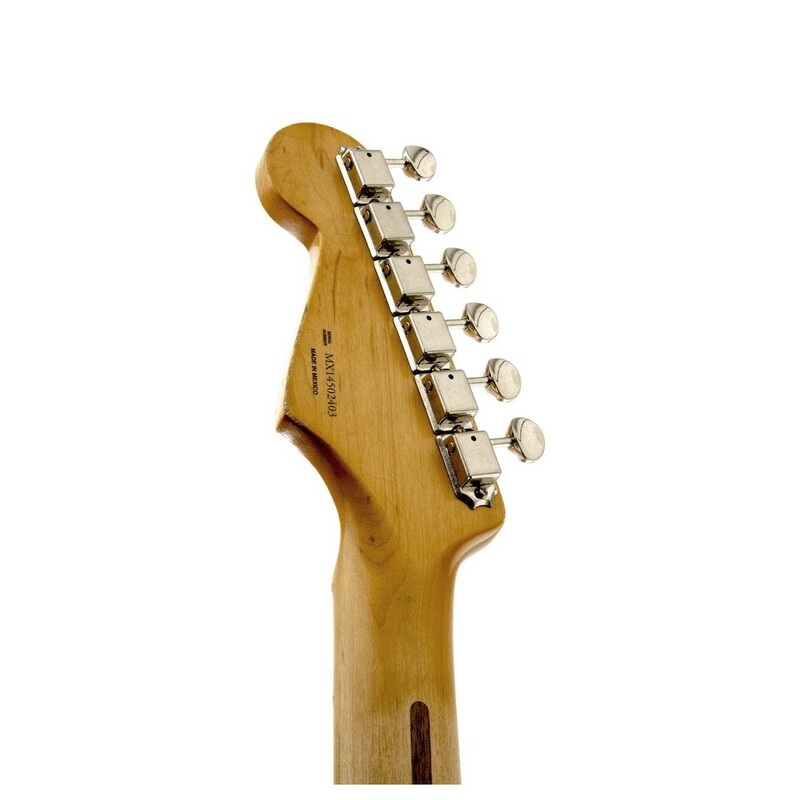 Featuring a carefully fitted synthetic bone nut, the Fender Strat delivers an increased resonance and bright tonality. When compared to traditional plastic and Tusq materials used to construct guitar nuts, synthetic bone improves the vibration transfer between the string and tuning machines without dampening the tone.